The tour can depart from Guatemala City or Antigua. The trip consists of a visit to Auto Safari Chapín zoo located at the pacific coast of Guatemala in Taxisco road near Escuintla. 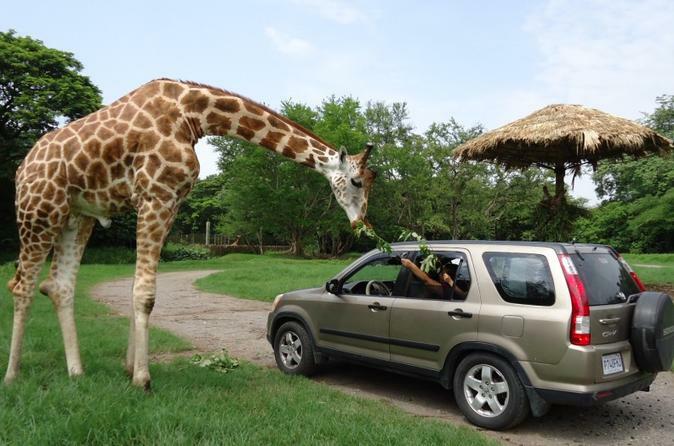 Auto Safari Chapín is the first zoo in Central America where you can drive through in your car and be in touch with wild animals while your car windows and doors are the only things that separate you from the animals. On the second day you will visit the black sand beach of Monterrico that offers an enabling environment for rest and relaxation. It is ideal for exploring efforts to conserve sea turtles, green iguanas and crocodiles. Mangroves are stopping hundreds of migratory and resident birds. With extensive and beautiful beaches of volcanic sand, Monterrico is ideal for enjoying the sea. 08:00 AM: Departure from your hotel in Guatemala City or Antigua to Auto Safari Chapín. We will enter by car to the facilities and will see the animals up close. During the tour you will pass by several "enclosures" divided by semi-natural fences and doors that are open for several towers located in the park. The park has a total of 14 venues, one of which is a sitting area where you can get off your vehicle, enjoy refreshments, and see the animals from platforms or viewpoints. The entire tour takes about 1 hour and a half approximately. After the tour time for lunch at the restaurant of the park. You will have time to relax and enjoy of the swimming pool located in front of the restaurant. In the afternoon transfer to your hotel in Monterrico beach. After breakfast, visit a “tortugario” (see turtle conservation). Here you can see the efforts for the preservation of the different species of sea turtles including white ridley and baule. In November massive releases of hatch-lings turtles are made. You can also see different reproduction projects of species such as the green iguana and alligator. Time on your own at Monterrico. The town is known for its volcanic black sand beaches and annual influx of sea turtles. During your stay you can watch birds, and other emblematic fauna. Enjoy of the laid-back atmosphere of the area, take a bath, relax and enjoy. In the afternoon relax on the way back to Guatemala City.